Book top-notch tours and first-rate activities in Costa Blanca online on sunbonoo and make the most out of your time abroad. Instead of getting off the plane and not having the foggiest where to go and what to do, put a stop to the what ifs and pre-book your activities before you even get there. Say no to sold out shows and give yourself the chance to seek out exactly what you fancy doing. As well as that, you cut down the risk of overspending since you’d have sorted everything out ahead of time. You won’t find yourself being talked into setting out on tours that aren’t right for you which can often be the case when you go along to tour and excursion kiosks. On the other hand, you can take all the time in the world to scroll through what we have on offer and pick something that’s just right for you and your loved ones. On another note, if you’re on the lookout for a present for a special occasion you might want to consider giving your loved ones something to do rather than something tangible here on sunbonoo. The Costa Blanca is the go-to place in Spain, its orange and almond trees and palm groves really make it stand out. The almost 3000 annual hours of sunshine and beaches that go on and on attract lots of tourism year in year out. The options seem to be endless thanks to the diverse landscape so take advantage of it by exploring it from every angle. It doesn’t matter if an active holiday floats your boat or you’d be more up for the culture – you can find what you’re looking for in Costa Blanca. We’ve summed up the best of the bunch to save you the trouble of scouring through. Boat trips in the Costa Blanca are a big hit and that shows no signs of changing any time soon, in particular the catamaran tours along the coast are loved by many. Breathe in the salty fresh air while you discover hidden beaches and bays or spend a romantic evening out at sea and sail off into the sunset on our Sunset Tour. The glass bottom boats on the Costa Blanca are a top pick for the little ones as they marvel at the underwater world. Water sports are a big deal on the Costa Blanca! Get your heart pumping as you brave it and go jet skiing or try out a banana boat tour. If you’re a fan of water and love a slice of the action, parasailing or paragliding could be of interest and you’ll get the chance to see the pretty places from a bird’s-eye view. Alicante as the capital of the province is the place to be when it comes to historic buildings, museums and galleries. Suss out the Spanish port city with a classic city sightseeing tour or with something a bit more exciting by picking a Segway tour. This is a winner with the kids as it makes what could have been a boring history lesson, an exciting flying adventure. If you really want to take things to the next level, then join a jeep tour or go off-roading on a buggy or quad tour! You could also check out the new craze, Canyoning. For those of you who like to keep fit, you’ll probably be up for some mountain hiking or some cycling. Get shown fantastic scenery and go in to the heart of the pine forests. 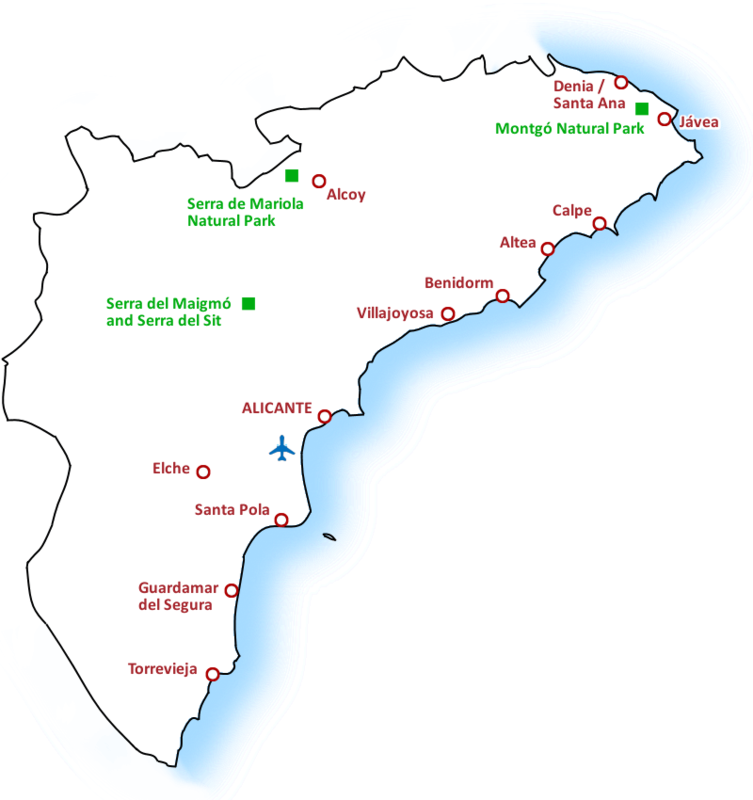 Get face to face with nature and as you see for yourselves that there is much more to Spain than sun, sea and sand. Kids go wild in Costa Blanca as there’s a lot to keep them on their toes like the aqua park Aquapolis in Torrevieja or get up close and personal with up to 1500 animals as you stroll around the Terra Natura Animal Park which is home to elephants, rhinos and different wild cats. The park is divided into the areas "America", "Asia", "Europe" and "Pangea volcano" so you’ll get to see lots of different types of wildlife. If you’d prefer to get acquainted with Costa Blanca without other people, then you could consider hiring a car and exploring the area in your own way. Book your holiday on the beautiful Costa Blanca and keep yourselves busy during your time away. The sunbonoo team is looking forward to making your holiday the best yet!